I write a lot and for many different purposes. I don’t like to fiddle with settings and formatting in a word processor. I want to concentrate on the writing. This is why I use markdown. According to Mark Gruber, the inventor of markdown, “Markdown allows you to write using an easy-to-read, easy-to-write plain text format”. Let's see what this means in practice by looking at a markdown formatted example. It is followed by some random text containing *three emphasized words* as well as **four strongly emphasized words**. We can add a standard [hyperlink to a favorite site](http://howto.savvity.net) like this. A new paragraph is created by preceding it with a blank line. All important-looking texts should have sub-headings, so let’s create one now. To make texts more interesting and easier to read you should have some lists in it. * This is a list item in our unordered list. * And the last one. 1. This is the first item of our ordered list. To finish this markdown code sample we can insert a cute photo. Imagine how much time we save by not having to search in menus to find the right formatting of every element of our text. You can do all the formatting on the fly while you concentrate on your text. Normally you write your markdown in markdown text editors. They have two parts. One is the editor and the other is a markdown converter. The editor often is an almost distraction free environment where most of what you see is your text. The markdown converter is what creates beautifully formatted text in many different formats out of your text. In the markdown editors I use, often an app called Ulysses, I can export my texts as Word documents, html (perfect for Wordpress), ePub (for e-books), pdf:s or rtf files. I have many options of different layouts. 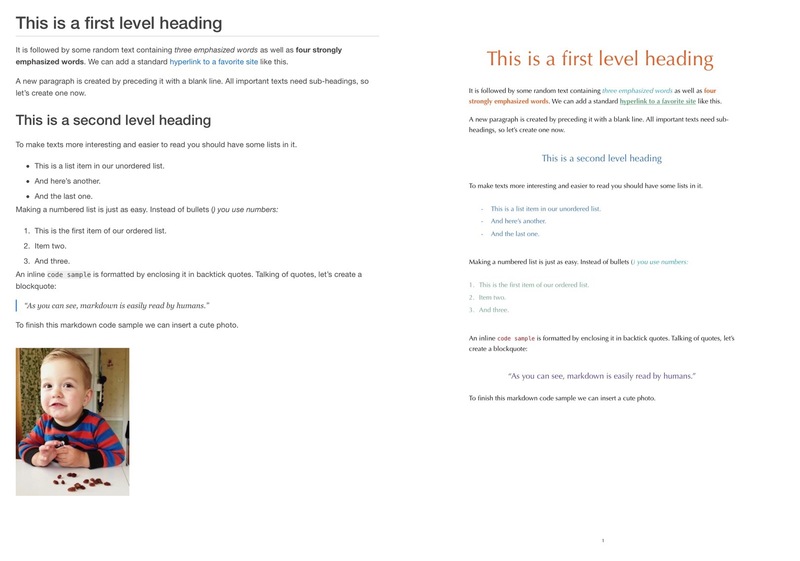 Below are two examples made from the sample markdown above. Just by choosing different layout templates I can give the same text completely different layouts. There are markdown editors for all computer platforms, including phones.